A kind Apatosaurus named Bronto discovers a nest full of Pterodactyl eggs. When he realizes their mother isn’t coming back, he decides he will care for them. But soon the nearby volcano shows signs of erupting, and Bronto must act fast to save his own life, and the lives of these baby Pterodactyls. In this beautifully illustrated prehistoric tale, children meet a very caring dinosaur, not at all like the scary beasts they might be familiar with. They also learn that it’s possible to think of others and help them, while facing a crisis themselves. 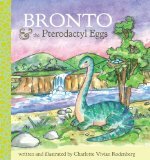 Bronto & the Pterodactyl Eggs is a sweet story. Although I wondered if it was really possible that the eggs could survive to hatch, the positive message of kindness to others made me look past my doubts. Any child who adores dinosaurs will enjoy this book.